Hazelnut Flavored Coffee tantalizes your senses and rouses your passion for exceptional tasting flavored coffee. This coffee is very aromatic with sweet, nutty undertones with a creamy smooth flavor. 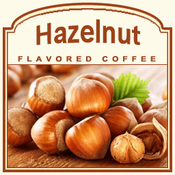 We use only 100% Arabica beans that have been freshly roasted just prior to flavoring and shipping, to guarantee Hazelnut Flavored Coffee perfection. These flavored Arabica beans brew into a sweet treat of rich hazelnut for you to enjoy everyday. A heat-sealed valve bag will ensure the freshest coffee which will be fresh roasted the day it ships. Enjoy!